Do you remember how Thornton answered Diane when she asked him, “Don’t you ever read?” Thornton said, “Read. Who has time? I see the movie. I’m in and out in two hours.” Do you feel the same about your safety manual? This exchange from the 1986 classic – Back to School – should strike a chord that accuracy, brevity and clarity are crucial when it comes to documenting safety policies and procedures. As employers, we are obligated to ensure the safety of our employees. 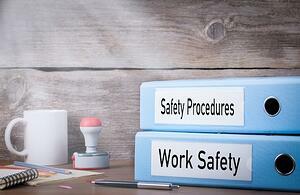 Your guide of documented safety standards is meant to turn the page on injuries and illnesses in the workplace. An effective safety manual is no easy task since your plan of action for establishing and maintaining a safe work environment includes communicating your safety policies. It all starts with a table of contents. From general safety policies to recordkeeping and from hazardous chemicals to risk assessment, your safety manual’s table of contents will serve as the foundation for communicating your safety strategy to your employees. Once you have established a final draft for your table of contents, a new blank piece of paper will be front and center and your safety programs will start to take shape. Your “plot” shall encompass proper safety policies and procedures relative to the unique specifications for your company’s scope of work. No lie… it is hard. Questions about which programs to include and the length of the safety manual will no doubt frustrate some, but you must not lose sight on what is at stake – your safety manual is designed to communicate your company’s dedication to the safety and health of each employee and management’s commitment to improve employee safety and health with education, training, and professional (and personal) development. Purpose – Why does this program exist? Background information goes here. Scope – Whom does this program cover? Involve all parties unless the program pertains to specific individuals. Definitions – Which key terms are important to the program? Include only relevant definitions (at least one / no more than seven). Procedure – How are your employees, supervisors and managers expected to perform? Include bulleted lists, pictures, diagrams, etc. to highlight the steps. Training Responsibilities – What sort of training will be needed to ensure the program was covered with your employees? Include the step to document your training. Training Frequency – How often will the training need to be performed? Use terms (e.g. upon hire, monthly, annually, as needed, etc.). These seven components are intended to achieve a well-structured strategy in communicating your company’s safety policies. Your safety manual deserves to be well-organized. Employees should find it an easy-to-read tool that is both valuable and useful. Ready to get started? Your safety manual deserves to be your company’s number one best seller. You and your employees deserve to take away the ultimate theme – Safety Matters. If you are having a bit of writer’s block – no problem. Let us help define, develop and deliver your manual to you. Our safety professionals understand that your best program will be useless if not properly implemented - starting with communication!